Product Description: Biotin is a water-soluble vitamin necessary for normal growth and body function. Biotin functions as a key regulatory element in gluconeogenesis, fatty acid synthesis, and in the metabolism of some Amino Acids. Alongside its role in energy production, Biotin enhances the synthesis of certain proteins. 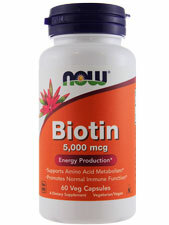 In addition, Biotin promotes healthy immune system function and plays a critical role in skin health.